Hurricane landfall research since 2006. Stations situated in fields at schools (almost 50%), nurseries, an Indian Reservation, an airport, and a prison. University students service and maintain the stations. 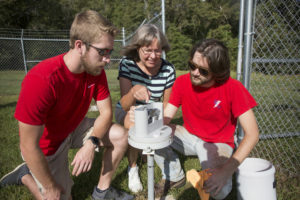 Other educational aspects include a course in the Meteorology program at the University of South Alabama, research projects for undergraduate and graduate students, K-12 outreach, and middle and high school teacher training workshops.